Have you ever wished you could stretch an ink cartridge’s life so that you wouldn’t have to buy a replacement so soon? There’s an app for that. As PCWorld's Serial Refiller, I’ve spent nearly a year trying various remanufactured ink cartridges and do-it-yourself refill kits. All of the alternatives I've inflicted on my trusty HP Photosmart e-All-in-One printer have been cheaper than the OEM cartridges (HP 60 black and tricolor), but with each one I've encountered a catch: a messy refill process, for instance, or inferior print quality. For my final experiment, I’m trying Inkgard’s wares. Inkgard sells remanufactured cartridges as well as the Inkgard software utility, which lets you dial back ink usage--as drastically as 75 percent--to stretch the cartridge’s life. According to Inkgard, the software acts as a printer driver, removing the desired percentage of ink (or toner pixels, if you have a laser printer) and reformatting the print file to enhance the image quality. A one-year subscription to the Inkgard utility comes with any purchase of Inkgard remanufactured ink or toner; it’s also available separately for $10. The software supports only Windows PCs, but it works with any printer and with any ink or toner cartridge. To get a fuller picture of how Inkgard’s products work together and with other inks, I conducted three experiments: printing with the Inkgard cartridges, with and without the Inkgard software, and trying HP’s own cartridges with the Inkgard software. My findings surprised me. The page yield from Inkgard's remanufactured cartridges, when used alone, varied widely. Among the three sets of cartridges I tried, only once did Inkgard's yield exceed the OEM ink's total of 134 pages--and that time, the output was disappointing. 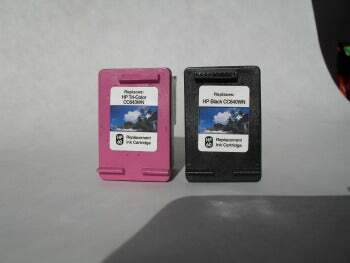 In addition, Inkgard's software provided less of a savings with the HP OEM cartridges than it did with its own cartridges. Finally, although Inkgard's software gives you lots of latitude to tweak the settings and reduce ink usage, you have to accept a trade-off between ink savings and print quality. My Serial Refiller short-term experiences are anecdotal, and they do not test the durability or archivability of third-party inks, nor how the printer will fare after repeated use with them. Nevertheless, my hands-on tests offer a taste of what you can expect if you try a third-party alternative with your own printer. Check out my prior Serial Refiller adventures to learn more about what it’s like to use refilled or remanufactured ink cartridges. Over the course of two months, I bought multiple sets of Inkgard cartridges online, and they always arrived at my doorstep within a few days. Like remanufactured cartridges from other vendors, the Inkgard tanks were visually indistinguishable from the HP OEM models, aside from the company’s stickers. Printing went off without a hitch. I ran the HP-recommended alignment procedure, and began printing. Aside from the usual warning messages that appear on the printer's control panel whenever I use third-party cartridges, I encountered no other glitches. None of the Inkgard cartridge sets, tried alone, were satisfactory in both page yield and print quality. The first and third sets of cartridges produced disappointing yields of 88 and 109 pages, respectively--both totals significantly lower than the OEM cartridges' yield of 134 pages. On the other hand, the prints they generated were impressive: Fonts were sharp, and colors were accurate. A closer inspection revealed slight banding on some of the images, but most casual users wouldn't notice the difference. The pages looked so good, in fact, that I found it difficult to distinguish them from those created with HP's own inks, which are the gold standard for the Serial Refiller. My test of the second Inkgard cartridge set was the oddball. Page output was higher than in the first and third tests, amounting to 151 pages versus the OEM cartridges' 134. Unfortunately, the print quality grew progressively worse, with fading colors, inaccurate flesh tones, and an odd, greenish tint appearing on one grayscale image. I averaged the page yields of all three sets of Inkgard cartridges to get a representative yield of 116 pages, resulting in an average per-page cost of 24 cents--no great savings compared with 26 cents for HP’s own cartridges. Among remanufactured competitors I've tried, Cartridge World's HP-compatible ink tanks cost me 19 cents per page, and Office Depot's ink cartridges cost 22 cents per page. Could the Inkgard cartridges regain some ground when paired with their ink-saving software? That would be my next experiment.